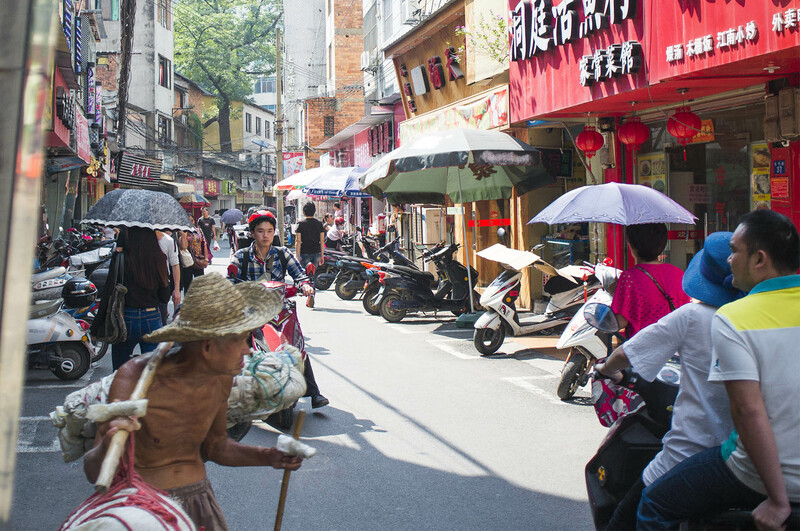 Nanning is a pretty standard Chinese city that serves as a transport gateway for travellers to and from Vietnam. The city has grown rapidly since the opening of its ports for international trade at the beginning of 20th century. 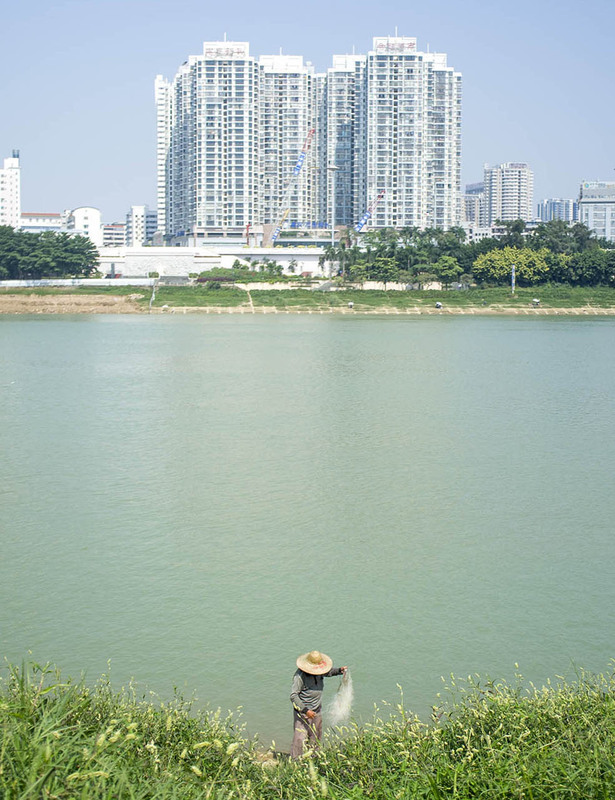 Nanning is the place of residence of minority ethnic groups, and ethnic conflict here is simply absent, as the majority of the urban population, representing national minorities, are virtually indistinguishable from the ethnic Chinese. 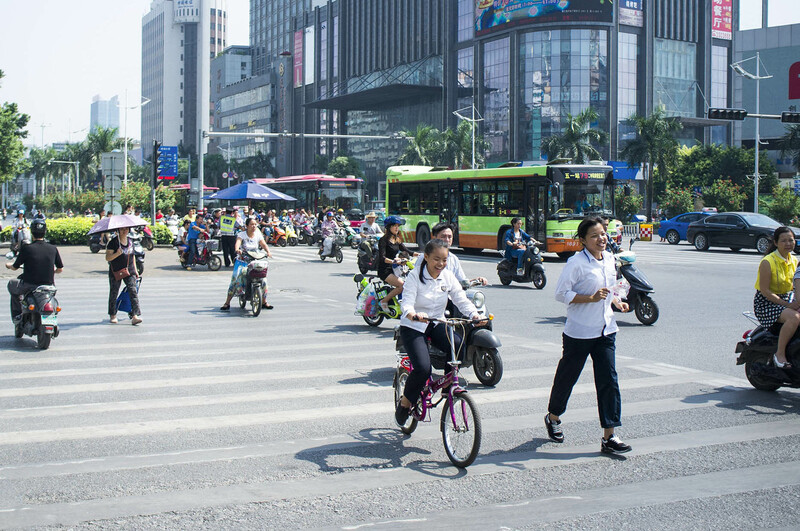 People cross the road on bike, motorbike and on foot. Lower and middle class walk on the same streets. For the person who speaks zero Chinese it is an entertaining challenge to communicate with Chinese people. It often feels like you are playing “Guess the name” game. When complications in understanding arise, you hit an impasse, when you completely stop understanding each other, you take a sheet of paper and start drawing what you need to ask, just like in the game. But when the locals want you to understand something, they will write Chinese symbols. Hard to imagine how they play cards. 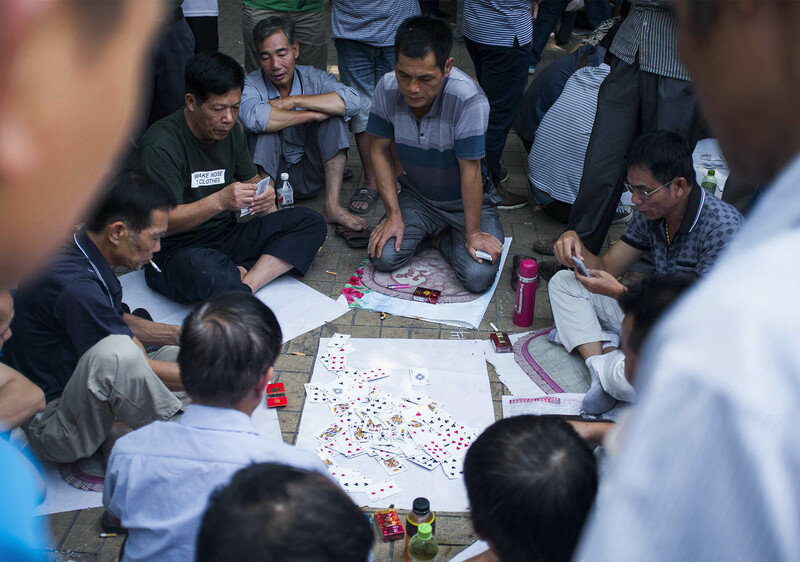 Though cards were invented in China gambling here is prohibited by law. All attempts to organise legitimate types of casinos in China have ended in failure, including Nanning. Nevertheless, the Chinese are very fond of gambling so they have to squander their money in Macau, Hong Kong and Taiwan instead. At the weekend parks are full of loads of people, with all kinds of entertainment taking place, starting with the sale of publications, appalling propaganda subjects, DVDs, and finishing with hounding rats with ultrasound. An armoured guard escorting a van in the street. The owner of a garage, boils offal. 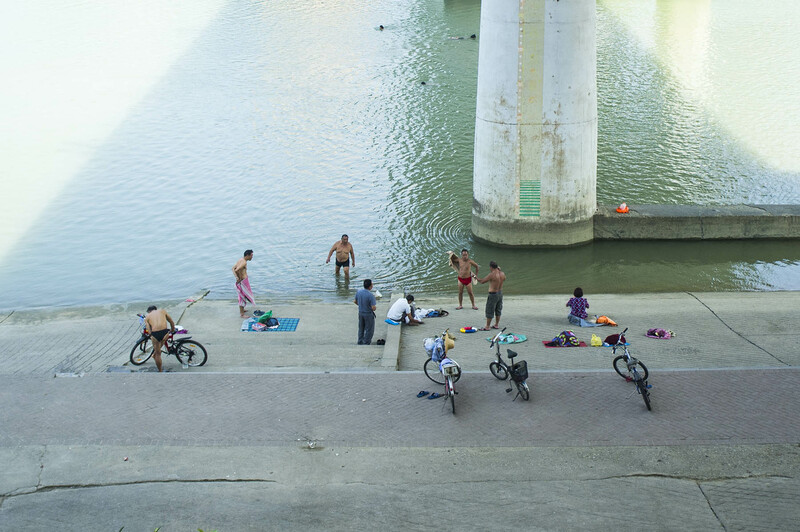 Nanning was the first place in China I saw people swimming in the river. What is interesting is the fact that they were swimming against the flow of the river. Each swimmer had a small waterproof bag, tied to him with a rope, which he dragged behind him. Some people would come on bikes swim for 15 minutes and cycle back. Some would swim for hours staying afloat in one position, some would cross the river. 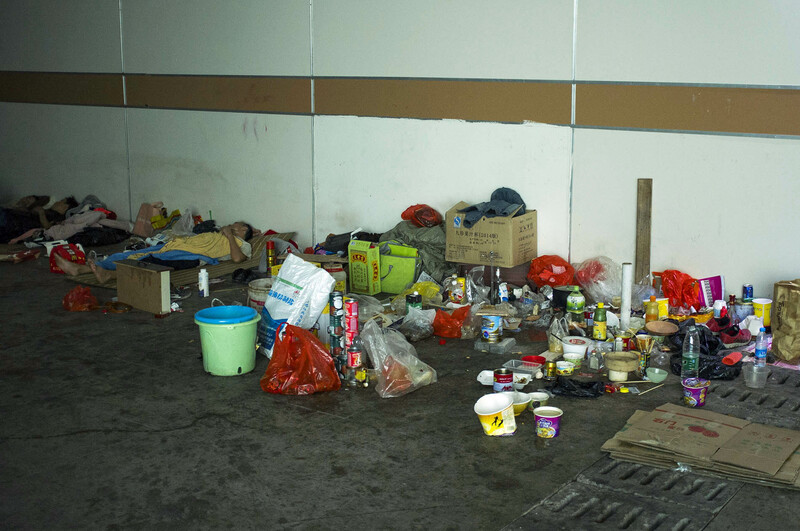 The only two homeless people I saw for the whole journey in China are sleeping in the subway. 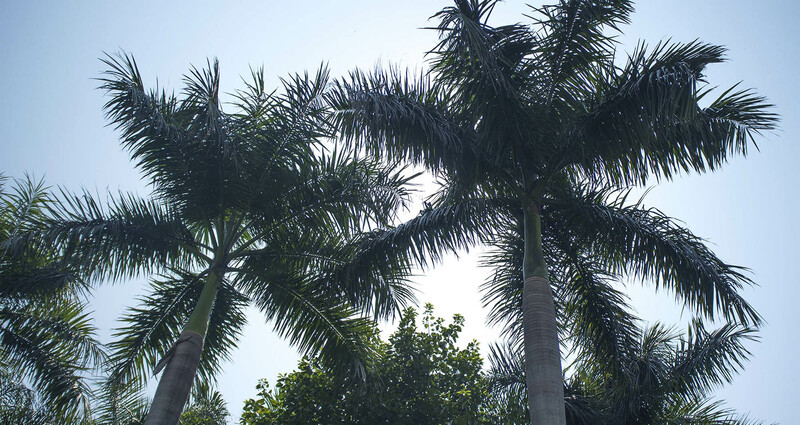 Palm trees in the park. 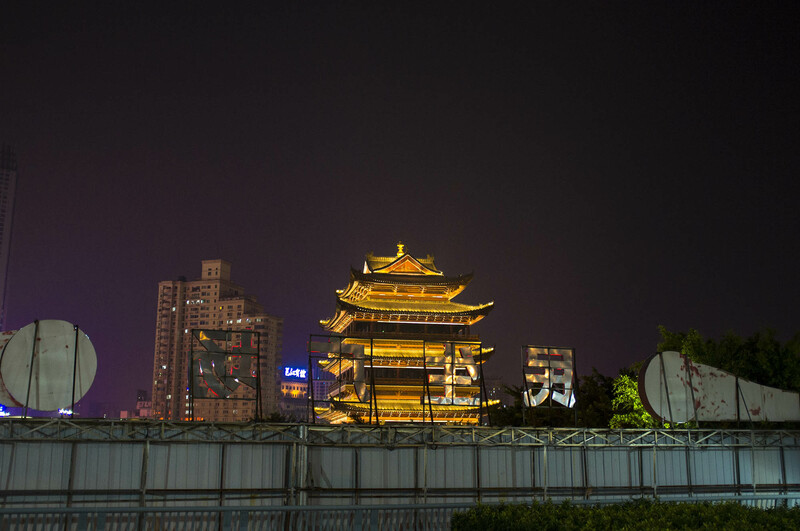 Due to Nanning’s location, the climate here is mostly hot and humid. Someone sitting in the shade, or a passerby with an umbrella is likely to be seen on a hot day in any other country, in China a shirtless man isn’t an unusual phenomenon. In China, local men cool themselves by rolling up their shirts and exposing their bellies which helps to create own personal air conditioning system. 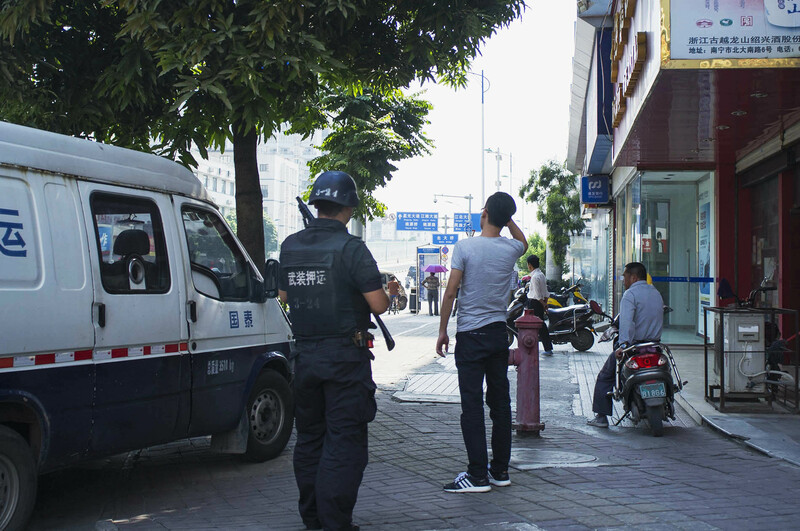 From the countryside to sophisticated urban centres such as Shanghai, men of all ages and social statuses resort to publicly displaying their bare bellies. To cool down some people choose to expose only their belly, because taking their shirt off completely might be embarrassing. Some people wear conical hats. Mind you conical hats are primarily worn by farmers as they serve the purpose of protecting them from sun or rain. 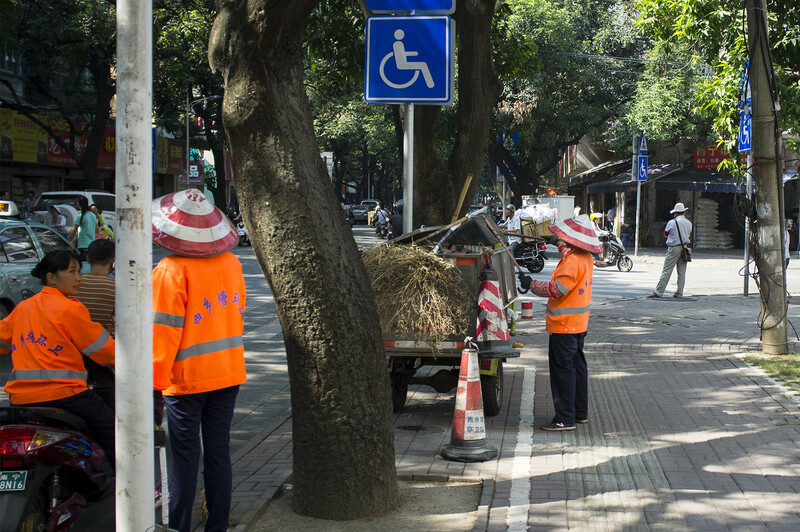 Street sweepers wear asian conical hats with hi-vis stripes. With the rapid growth of personal income and living conditions over the past decade, the Chinese appetite for fashion has grown. With a population of one and a half a billion people and a tendency to want to become more fashionable and different from others, China is swiftly moving away from fake designer fashion, offering both rich and poor the opportunity to cultivate their own style and not only follow trends. This means that there is a class of consumer of luxury brands that are loyal customers and pay great attention to style, quality and brand image. All of these elements can effect the middle class consumer, but they tend to have weak brand loyalty. For the low-end consumer price continues to be a determining factor in their buying behaviour. 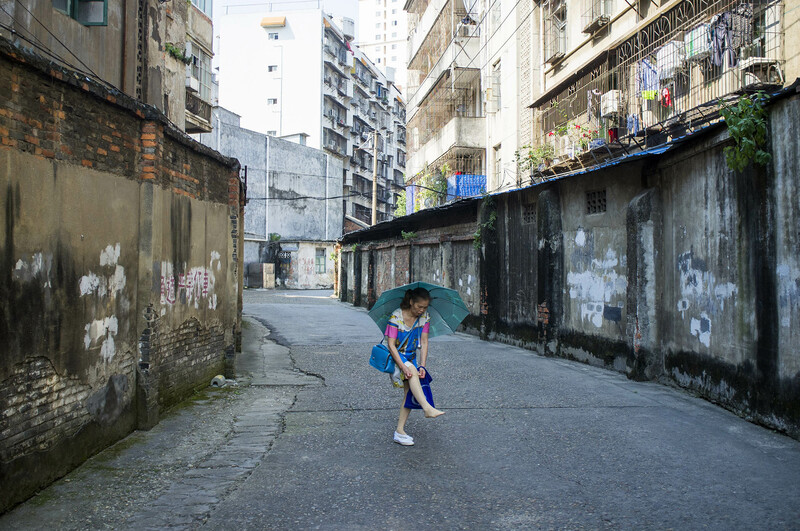 Before seeing me, this woman in Nanning downtown, with an umbrella was walking down the street with her tights down and as I came closer she pulled them up all the way. Umbrellas are used to cover up from the sun. 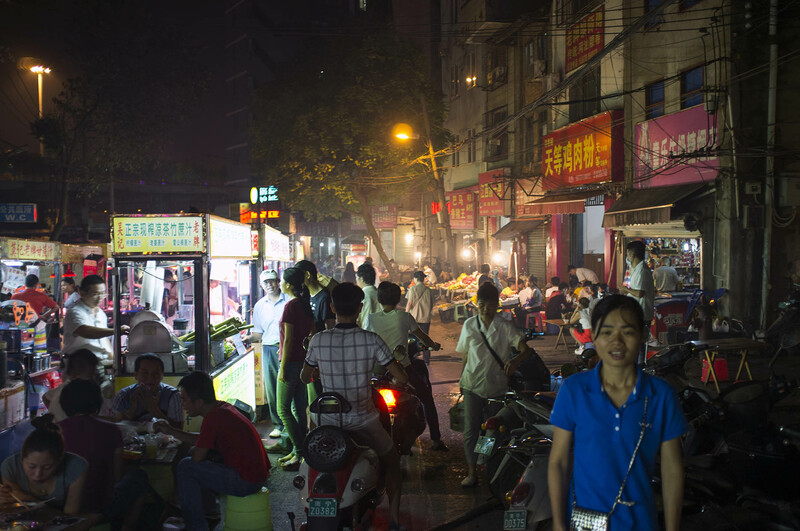 At night streets are transformed into night markets, which are perfect for all sorts of delicious and cheap food. Where people can choose from eating snacks to full portion meals. Temple on the river bank glaring at night. 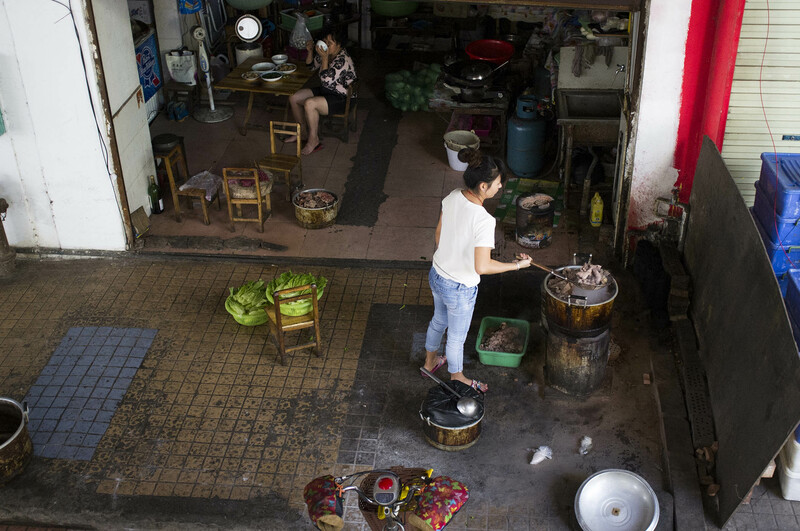 As well as Nanning’s own cuisine dishes from other parts of China are also on offer, and even some from abroad. 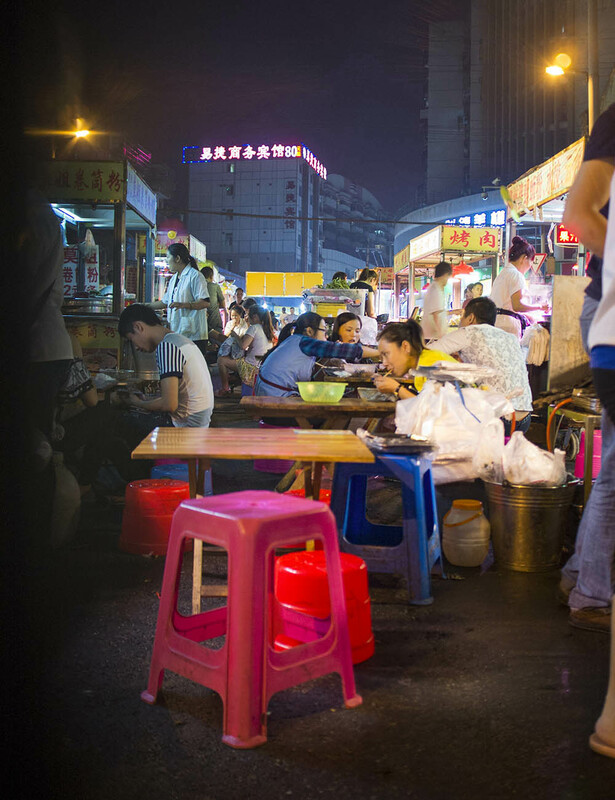 The traditional culture of eating can be found on almost any street in the city. 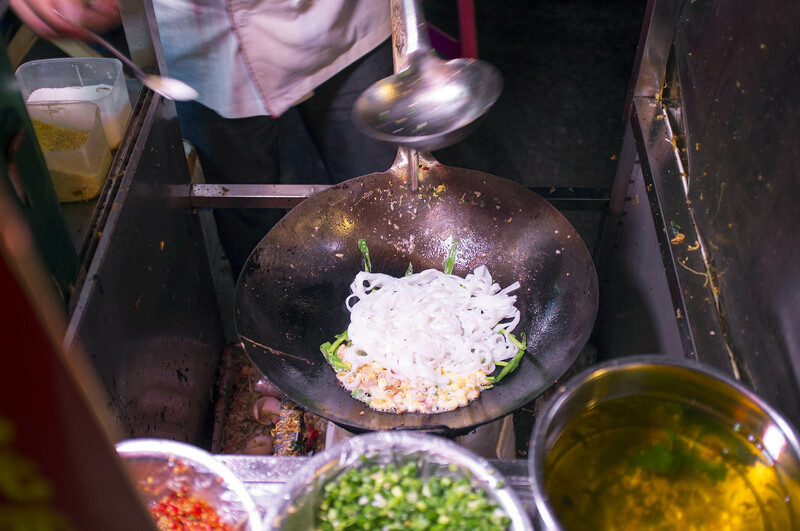 MSG – a flavour enhancer is widely used in the street food in China. Before you get your portion of noodles the cook will put in a spoon of the white glutamate stuff with the speed of light. That makes noodles taste noodlier, rice ricier and meat meatier. The difference with other countries lies in the fact that you won’t see it being put there openly. 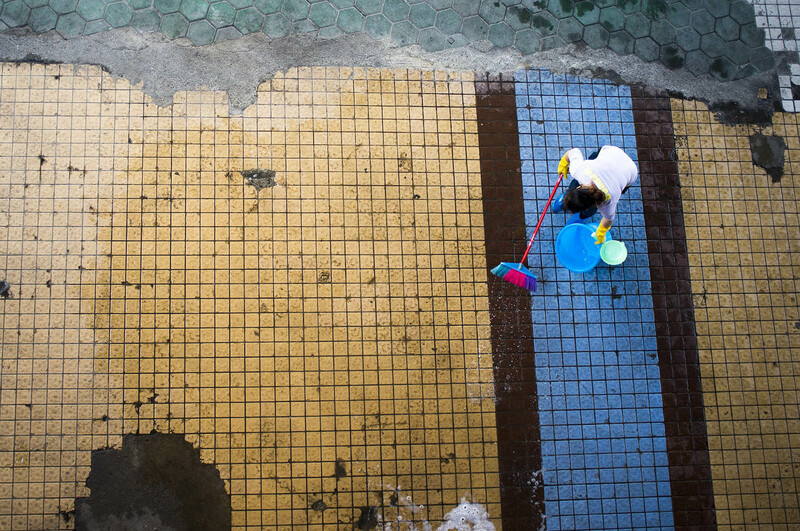 Nanning isn’t an exception. Man is putting glutamate in to the stir fry noodles. 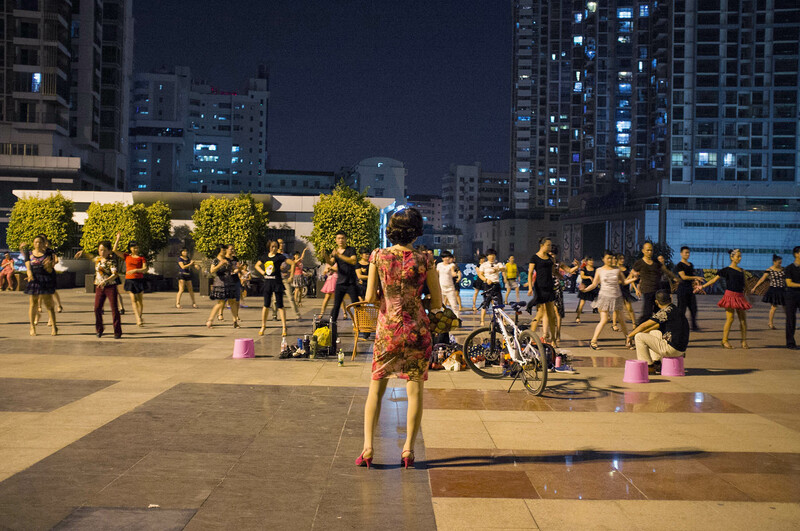 As I mentioned earlier, the Chinese love to dance. In the evening a lot of people are gathered on the waterfront to dance either tango or breakdance.